Sen. Antonio Trillanes IV is confident that the Armed Forces of the Philippines is united and will not resort to extraconstitutional moves, but said the people’s voice of outrage could always prompt the military organization to take action. Trillanes, the mutineer-turned-senator who is facing arrest after President Duterte revoked his amnesty, said in a press briefing outside his Senate office on Friday that he never doubted the military’s loyalty to the Constitution. “The AFP is united. There may be differences in personal opinion but they are united. As far as loyalty is concerned, they are loyal to the chain of command and to their mandate, the Constitution,” he said. “There’s no crack [within the military]. They may be conflicted but it doesn’t mean that there’s a faction. They are loyal to their constitutional mandate,” he said. Asked what it would take for the military to make a move, Trillanes said the people’s overwhelming voice of outrage was a possible game changer. “Just like what happened in Edsa 1 and Edsa 2, what they may be waiting for is the people, once they [become] so fed up and begin to speak [up]. 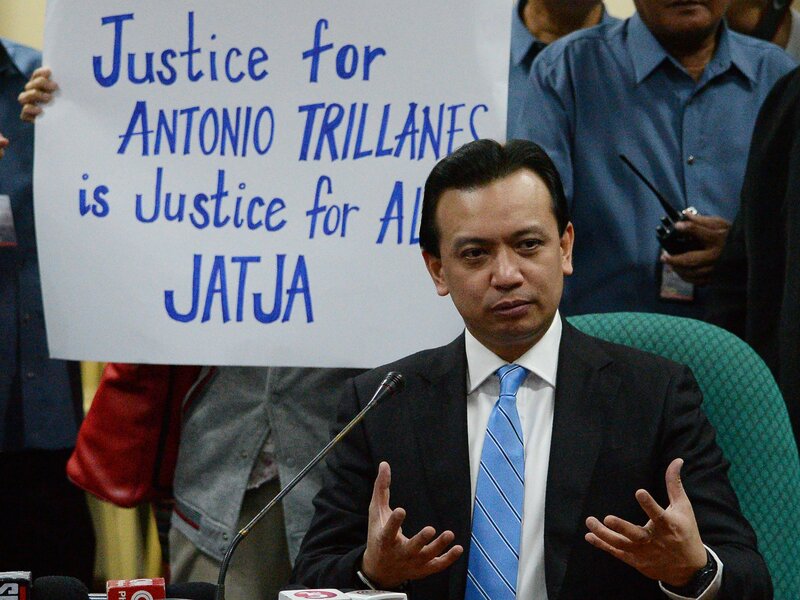 We will never know,” Trillanes said. “History will tell us—that was what happened in Edsa 1 and Edsa 2. It [will be] palpable. You can feel it when the time is right,” he added. The former Magdalo junior Navy officer claimed that some active military officers had expressed concern about Mr. Duterte’s revocation of the 2011 amnesty granted him by former President Benigno Aquino III. “They are hoping that they won’t be used in this political exercise of Mr. Duterte. They want to remain professional. That’s their concern,” he said. The officers, he said, categorically support his contention that the President’s Proclamation No. 572, which orders the revocation of his amnesty and his arrest, was unconstitutional. Trillanes said the number of military officers who expressed their concern for his plight was “very significant,” although they could not express their support publicly. “They are aware of what’s happening in our country,” he said, adding he did not mean that the military officers would disobey the President. Mr. Duterte’s fierce critic does not see the need to communicate with the military’s top brass, who joined the President’s official visits to Israel and Jordan. “I respect them enough that I don’t need to communicate with them directly. I know that they know what is legal from illegal,” he said. Former presidential spokesperson Edwin Lacierda lamented that the interpretation of laws had changed under the Duterte administration. Lacierda, a lawyer, cited as examples the ouster of former Chief Justice Maria Lourdes Sereno from the Supreme Court and the revocation of Trillanes’ amnesty. “When I was still studying law, we were surefooted on what is the rule of law. Under this administration, honestly, the goalposts have changed,” Lacierda said in an interview with ABS-CBN News Channel. He explained that a Chief Justice could only be removed through an impeachment trial, but Sereno was removed through a quo warranto proceeding. In the case of Trillanes, he said the grant of amnesty could not be revoked anymore. Lacierda described as a “ridiculous proposition” the government’s reason for revoking the senator’s amnesty. “If there is an application form, there is an admission of guilt. It’s plain and simple,” Lacierda said. “It’s so funny. Their argument is just so ridiculous. Pardon me for saying this, but it’s a ridiculous proposition to say that the amnesty is void ab initio on the ground that there was no application form,” he added. “President Duterte would like to project himself as a toughie. If he’s really a tough guy, I challenge him to muster the needed political will to tame the country’s rising inflation rate,” she said in a statement on Friday. “The real enemy is inflation. The so-called strongman should get tough on inflation, not the opposition,” Hontiveros added. The attack on the Duterte administration’s critics was designed to mask the effects of inflation and divert public attention, she said.